What is the Microsoft Desktop Player? Home » Microsoft » What is the Microsoft Desktop Player? 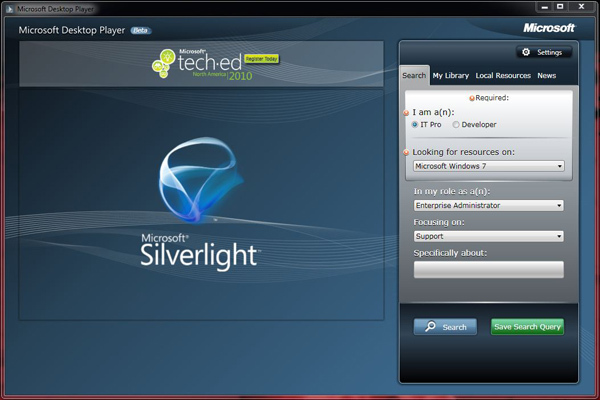 The Microsoft Desktop Player is a new tool for IT professionals, (Note: You need Silverlight installed for it to run.) I’ts designed to put IT Pros/Developers in touch with technical content. First impressions are good, my only gripe is,the settings you can only enter US Zip codes (So we in the UK will have to wait for the post code system to be added). Here’s Some screen shots so you can take a look (Taken from the stand alone application).